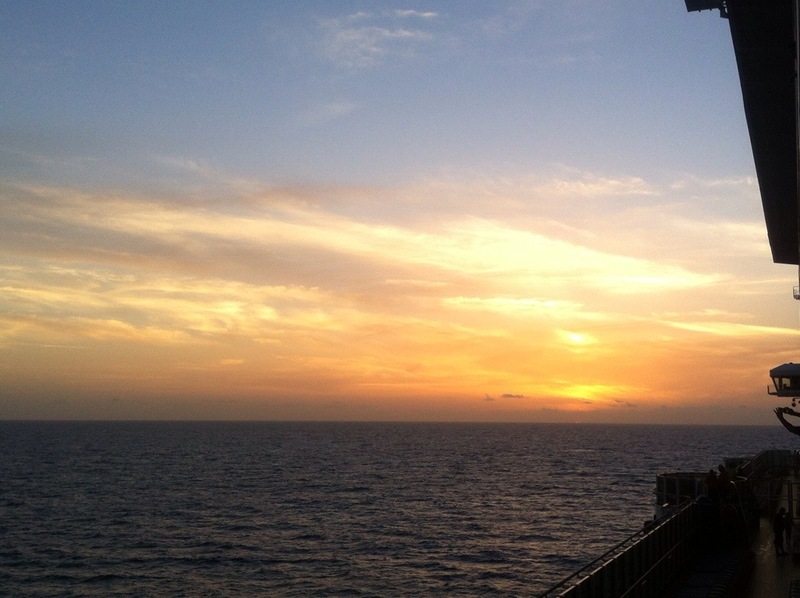 Crystal clear waters that seem untouched are what makes Mexico’s waters so desirable. The water was so unbelievably blue and clear that I needed to be convinced that the water was real and not dyed. Maybe I thought it was so fascinating because I grew up next to beaches with brown and sandy water… but it’s just perfect.. like a utopia.. it couldn’t get any better. I went snorkeling with my brother and my dad to see coral reefs and the amazing, vibrant colors of the ocean floor. We saw eel, needlefish, pompano, sea urchin, lionfish and so many other amazing creatures that people are so used to seeing in zoos. It’s funny how I felt because I’m so used to living in the city that it was weird seeing such creatures out in the wild instead of tanks in the aquarium. As I spent my time in the waters I really wish I could become a fish or something (I’m not crazy) but I would swim the entire ocean just to see everything else that is so eye-opening. The only part I didn’t like was that the water was soo incredibly salty. I, unfortunately had a few gulps in my mouth. It literally felt like I took a handful of salt and shoved it down my throat. However, it was so salty that I could lay on my back, float on the water, and allow my skin to soak in the sun. I found a can of black beans in my pantry, and I wondered to myself, what am I supposed to do with this? I rarely eat black beans, and the only recipe I could think of was making a veggie burger. Here is the recipe that I came up with, and I have to tell you, it tastes so meaty and flavorful that its really difficult to tell that it isn’t meat. Now, if I feel like having a burger, I’ll definitely have a veggie burger. It is so many times healthier and not greasy at all. 2. Onions, garlic, and carrots into the food processor. Pulse until you have small chunks of onions and carrots. 3. In a bowl, mash the black beans until pasty. 4. Combine onion mixture into the beans. Add cumin, cayenne pepper, egg, breadcrumbs, and bbq sauce. Form into patties and either grill or pan fry. Another long and enjoyable day in NYC. I was freezing my face off because it was 25 degrees but the wind made it feel like below 10. For half of the day, I was able to shop on 5th avenue, and of course, i did some major damage to my wallet. I don’t recall ever buying so many things! But I was awed by the large stores! All these stores were 3 or 4 times the size than the stores that I shop in. And the Forever 21 was 4 stories… I could honestly spend a whole day in there! At around 4, I went to get a backstage tour of Lincoln Center… and it so happened that fashion week was taking place there! So many models in crop tops or dresses in such freezing weather. After lincoln Center, I went to Hard Rock Cafe in Times Square. I ordered a honey mustard chicken sandwich, and I was happy to say that this was much better than yesterday’s Dallas BBQ dinner. We listened to rock music and chatted with out food. Then, we headed to Nedelander Theatre to watch the broadway musical NEWSIES!! WOW… Word cannot express how amazing this music is… It was so worth it because there was great singing, dancing, and acting. Maybe i shouldn’t have been so crazy because I lost my voice for screaming and cheering so loud. I would watch that musical 10 or more times. I just doesn’t get old! Directions: Combine flour, oats, sugar, baking powder, soda, and salt. In a large bowl, beat the egg lightly. Stir in the milk, oil, and vanilla. Add the mashed banana, and combine thoroughly. Stir the flour mixture into the banana mixture until just combined. Line a 12-cup muffin tin with paper bake cups, and divide the batter among them. Bake at 400 degrees F (205 degrees C) for 18 to 20 minutes. 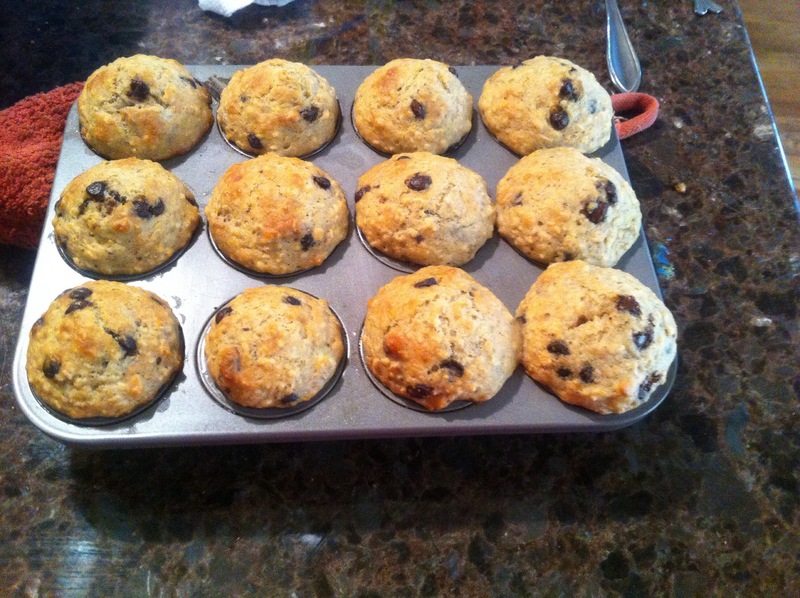 I baked my muffins in a small muffin pan to make it a delicate finger food. I also added mini chocolate chips and chopped walnuts to add more flavor. I really suggest adding the mini chocolate chips, because chocolate makes everything better!! Happy Cooking! 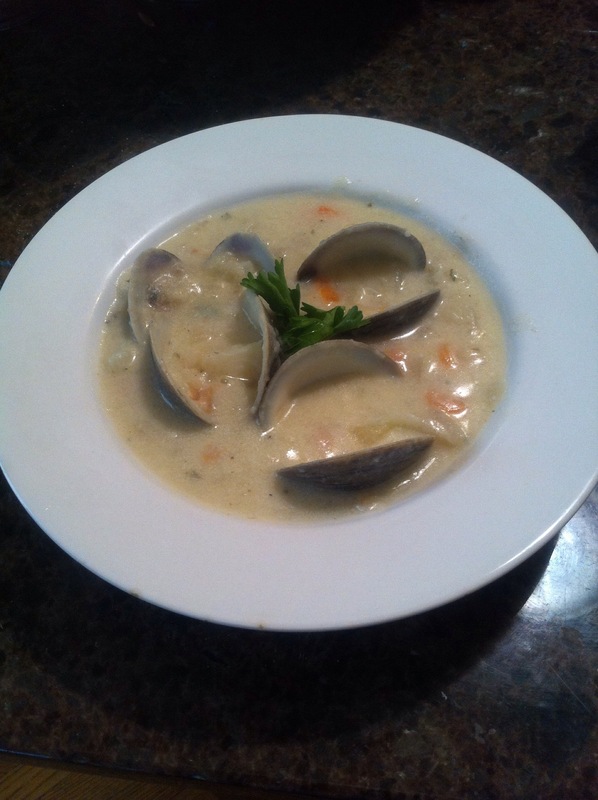 Want to enjoy the fresh flavors and creaminess of clam chowder but don’t want all that fat from the cream? Don’t worry because there is a delicious alternative! It all happened when I had no heavy cream in my fridge, but I was really craving clam chowder… and not canned clam chowder. The secret is making potato soup and adding clams to make clam chowder. I didn’t have a potato soup recipe so I just added ingredients as I went, tasting and adding flavors. The potato soup was a base of milk and potatoes mashed up. The mashed potatoes creates a creamy texture instead of cream. I added a little butter, which I used to saute the onions and carrots. Fresh parsley, salt, pepper, and dry parsley were the only condiments I added. The juiciness came from the vegetables and natural salts came from the clams. I removed some clams from the shells, chopped them, and threw them in, while I also added the whole clams. The whole clams really adds to the presentation. I’ve never seen anyone put whole clams in, so I thought it would be really original to add them in. However, I had to scrub the clams really well (like 10 times) to remove all the sand! Yes, very tedious work. Top the soup off with grated parmesan cheese and fresh parsley for a beautiful presentation! Maybe I was overly obsessed, but I had 4 bowls, and I genuinely regret it, but it’s just so delicious! Mmmm what a day to enjoy hot steaming calzones oozing with cheese and a fresh mussel pasta in white wine sauce! The weather is quite chilly outside as I snuggle in my fuzzy blanket on the couch. I run to my kitchen and whip up some easy dishes for lunch. For my calzones, I take a quick shortcut and use Pillsbury dough instead of making my own. Now, this is a very time-consuming and money saving trick! And it turned out deeeelicious!! 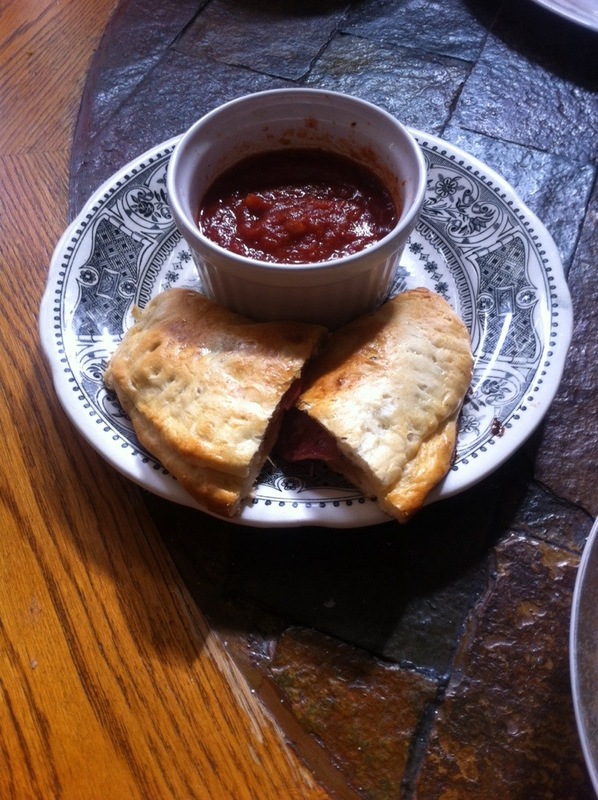 I stuffed the calzones with salami (didn’t have pepperoni) and mozzarella cheese. I brushed the calzones with an eggwash and into the oven they went. Serve with marinara sauce. For the pasta, I used the super, extremely fresh mussels, and oh my, the meat was so plump and juicy!! 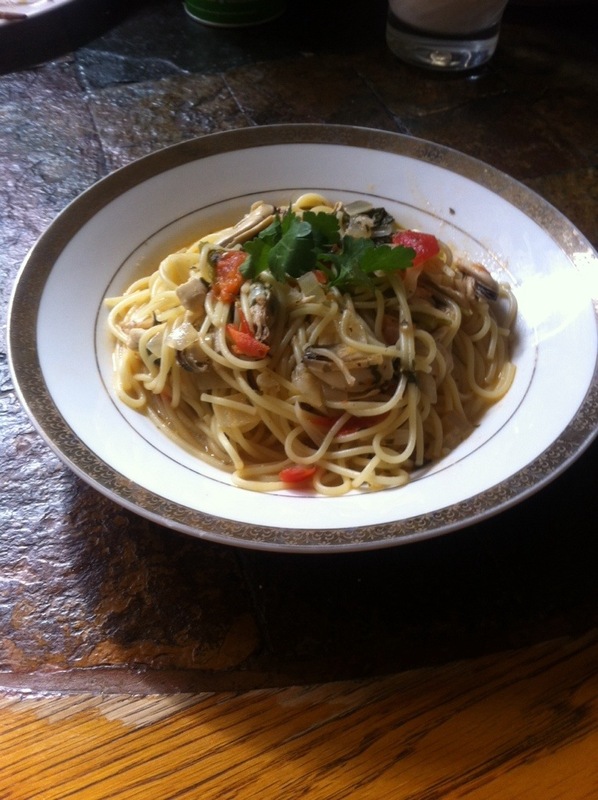 I cooked the angel hair pasta while I cooked the mussels in butter, olive oil, white wine, lemon, onion, and tomatoes. I threw in a bit of fresh parsley, salt, and pepper. Ok… so washing the mussels was not the most exciting part, but the result is totally worth it! I removed the mussels from the shells and tossed the pasta in with everything. Top off with a bit of fresh parsley and TADA!!! Delicious and quick Italian lunch! Saturdays are amazing since I get to cook all afternoon. I have never cooked potato soup before so I bought some potatoes and decided to cook some potato soup. I searched for two recipes and combined them together to make an original. I also spiced it up with a few secret ingredients that I added. It turned out to be so perfect, and I think everyone needs to have some potato soup during fall! The best part is, I didn’t use heavy cream! ( which is more fattening and expensive) Happy cooking! During the week, I always look forward to the weekend just because I get to relax, work on my artwork, and cook! The weeks are so stressful and I never seem to have a good meal. Every weekend I like to cook something new, so today for lunch, I decided to treat myself by making a sandwich with prosciutto, brie, basil pesto, shallots, and lettuce. The sandwich may seem like an unusual combination, but all the flavors work so well together. I also made a vegetable soup, which is absolutely nutritious, and some roasted fingerling potatoes seasoned with olive oil, parsley, and salt and pepper. It was so nice being able to sit down and eat a restaurant style meal. I had a great time preparing the food and it was cheap compared to going to a restaurant and ordering a meal like this. I really like to buy crescent roll dough and put a filling in to make a really delicious appetizer. However, the dough can often be pretty expensive, about $2.50 a can so I will wait for there to be a coupon or either on sale. Today, I went to H-E-B and I was so excited when I saw the dough on sale for $1.50! I should’ve bought 5 cans but I only bought 1(now I regret). When making these appetizers, the possibilities are endless! Today, I decided to stuff the croissants with ham, provolone cheese, and some marinara sauce. I had some leftover lasagna and there was wayy too much sauce, so with the leftover sauce I just decided to put them in the croissants. I put the ingredients, rolled them up, and baked them in the oven for about 15 minutes at 350 degrees. When the timer went off, I ran to the oven and the aroma in the kitchen smelled like HEAVEN!! I served them up with some ranch and a piece of lettuce to garnish. (P.S. I didn’t need the ranch, but the ranch makes the presentation better so….) This recipe is so simple, so delicious and cheap and I used some leftovers!